Spring is finally here. The clocks have gone back, the evenings are drawing out, and the mornings are getting lighter. I’m not great in the winter, I suffer from SAD and so this time of year signals easier and brighter times ahead. 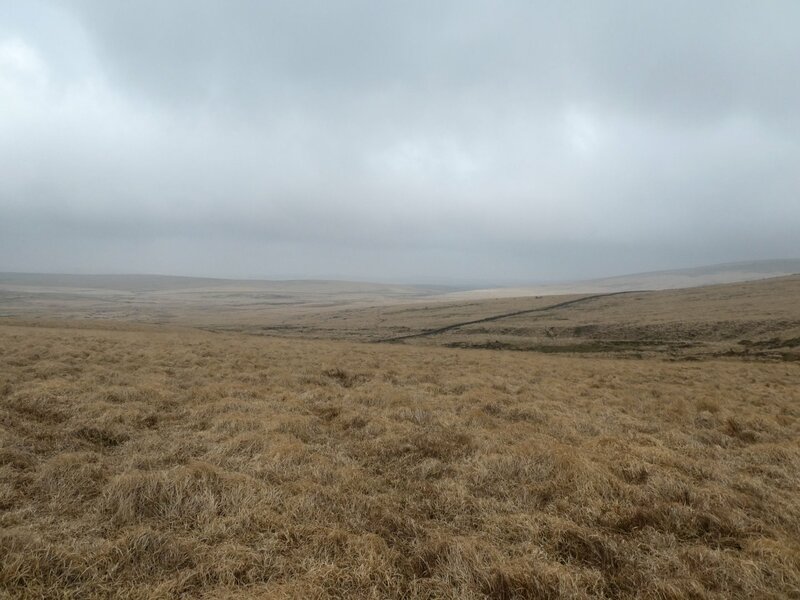 Being out on the Moor in the fresh air, on my own with just my thoughts and enjoying exploring Dartmoor has always been ‘mind-saver’ and offers me an escape from the drudgery and boredom of sitting behind a desk five days a week. 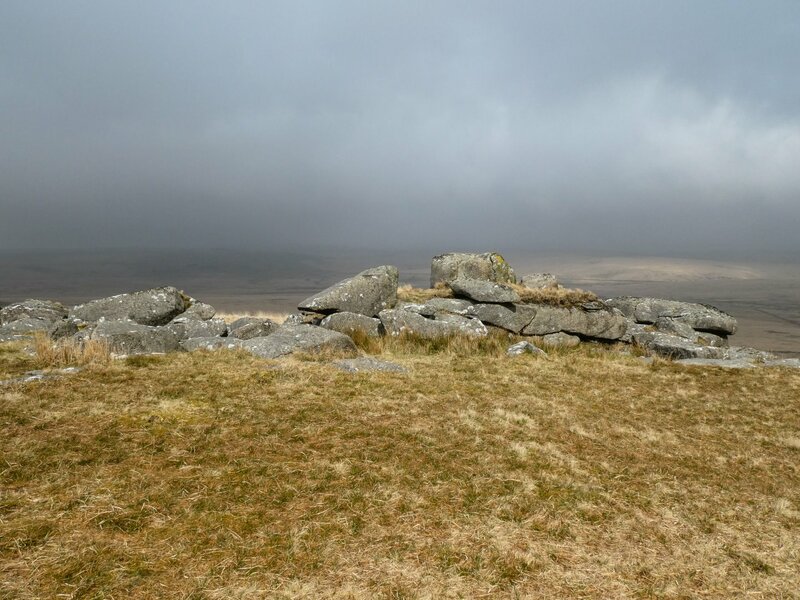 So bright sunny spring days, where better than a yomp out to Fox Tor & Childe’s Tomb on the SE side of Fox Tor Mire? The problem today was it was far from spring like…. 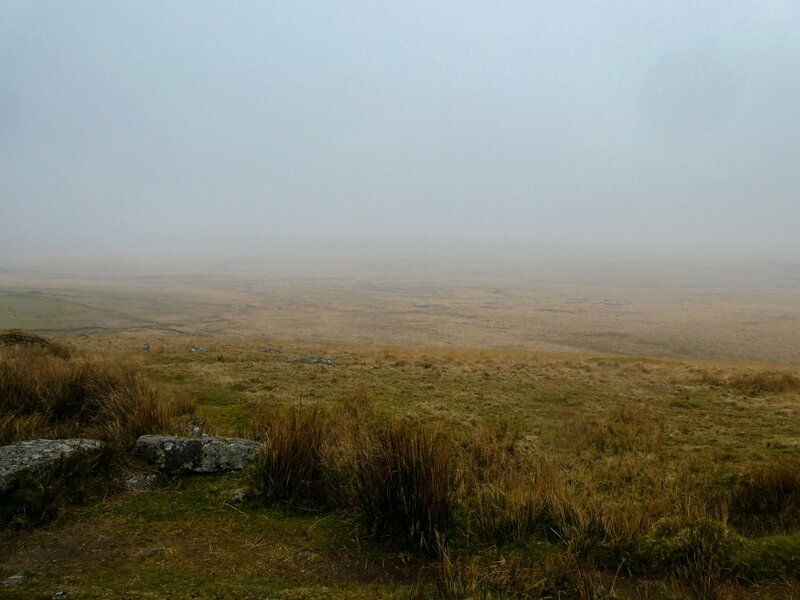 thick Dartmoor mist had enveloped most of the Moor as I drove down the Whiteworks road from Princetown. After several days of rain, the Mire itself was going to be ‘challenging’ or more likely just downright dangerous. 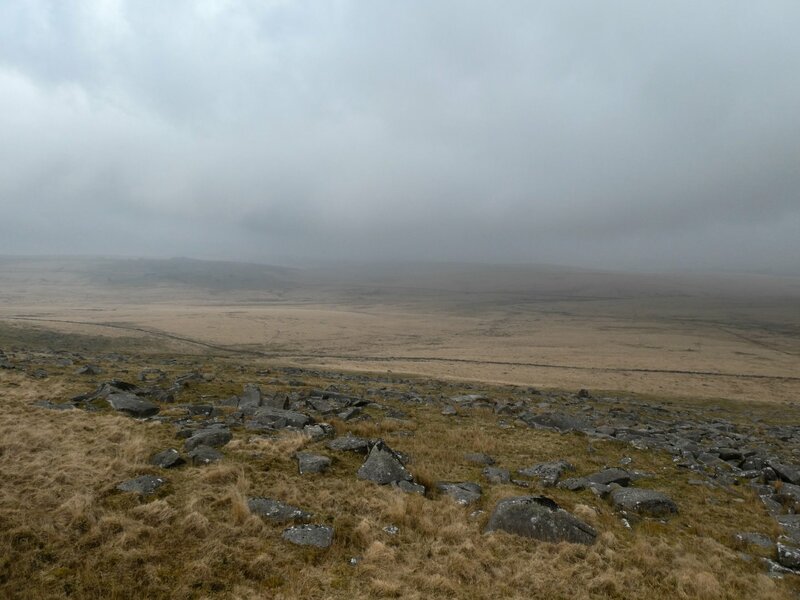 As I’ve mentioned several times in this blog, this part of Dartmoor is my favourite and I’ve been coming out to Whiteworks since I was first able to drive. 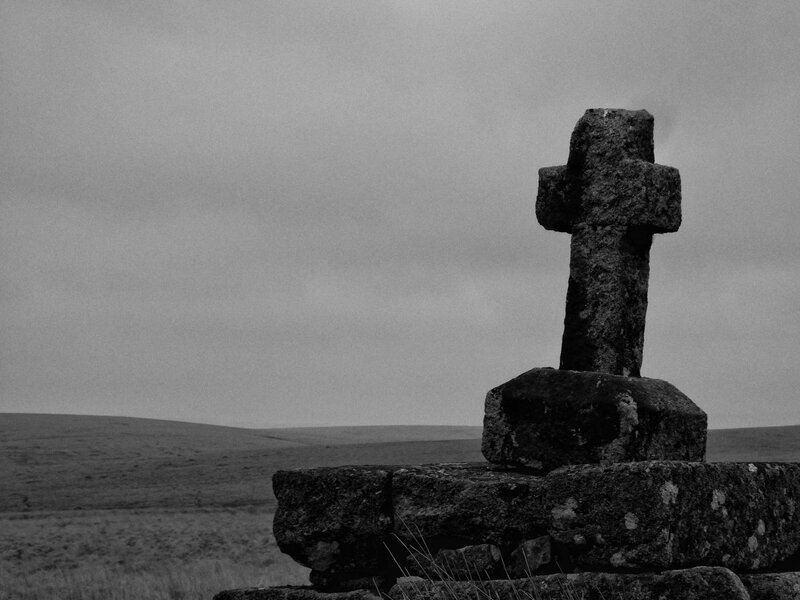 Fox Tor Mire itself is a huge draw for me and I’ve crossed it many times in the last 35 years. 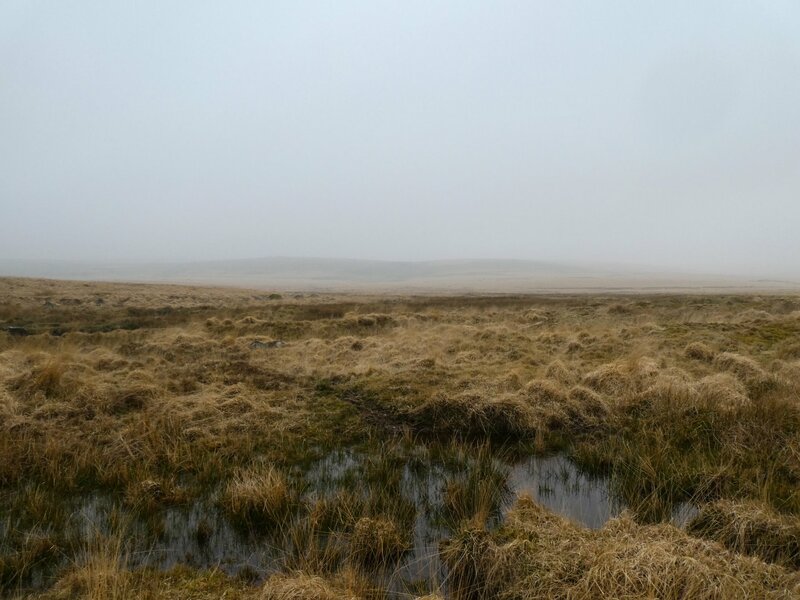 Last year when we had the ‘heatwave’, the mire was all but dried up and was crossed as easily as any other part of the moor, however today I was expecting a very different story. I decided to try something different, something I’d not considered before, to try and walk around the NE edge of the mire and use the higher ground to keep my feet dry all together by bypassing the monster bog. I had studied the map and also Google Earth to look for possible crossing places over the River Swincombe and planned a route. I parked my car at the same spot I had done last year when I crossed the mire (SX608708), put my boots on and decided that I should go for the gaiters too. 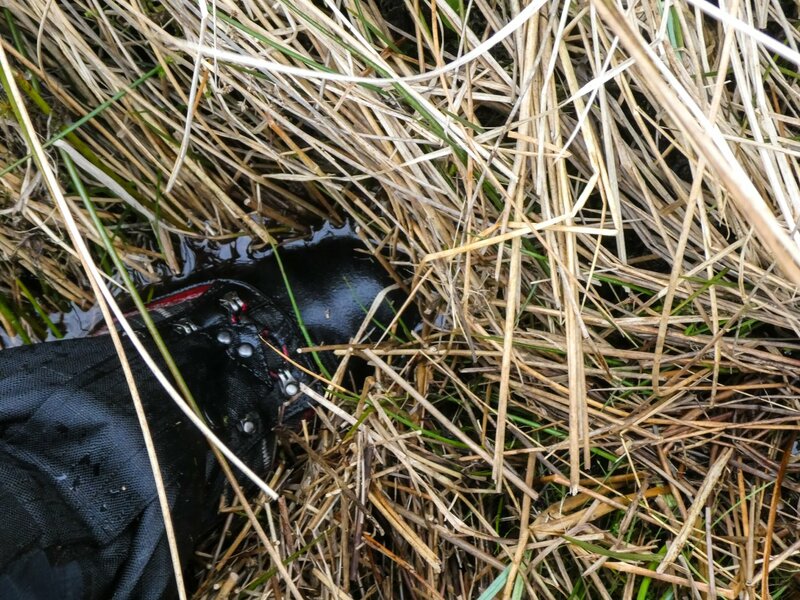 I rarely wear gaiters however on Fox Tor Mire it’s always an essential piece of kit…. even though I wasn’t planning on getting my feet wet! I marched off down the hill toward to cottages at Whiteworks, followed the track up to the boundary wall and followed the wall along until I came to a little river marked as ‘Strane River’ on the OS map. I didn’t fancy the balancing act needed to cross the pole that continued the boundary wall and so I hopped over the wall and found a crossing spot 20m upstream. 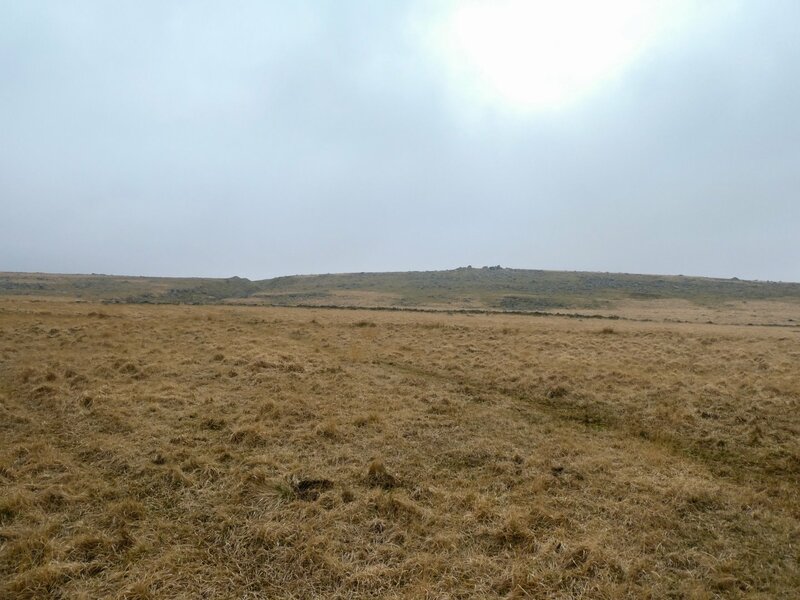 I continued to follow the boundary until I was level with the spot where the valley narrowed and the Swincombe flowed away from Fox Tor Mire. I made my way across the rough ground down to the river and started looking for the crossing places I’d identified on Google Maps. Inevitably they turned out to be useless as the river was too wide, fast or deep and so I set out searching for alternatives. The problem at this spot is that the river is divided into several channels by old mining works which meant I was actually going to have to make several crossings. I made my way across several of the riverlets however when I got to the last one I just couldn’t find a safe way across and ended up moving further into the mire searching for a crossing spot. Eventually I found one and got across however this left me far deeper into the mire than I had anticipated at the start. I stood there taking stock of my surroundings, looking for the easiest and safest way out of the bog and identified what looked like better ground about 30m away. 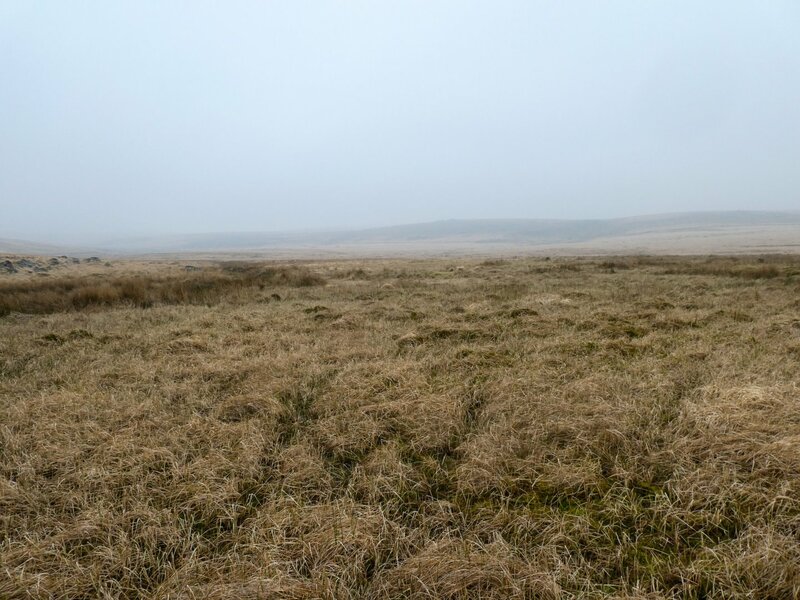 I made my way slowly across the mire from grass tuft to grass tuft but before too long I realised that my situation wasn’t improving and I was completely surrounded by the bog, not just your normal squelchy bog but the infamous Dartmoor ‘Quaker Bog’. 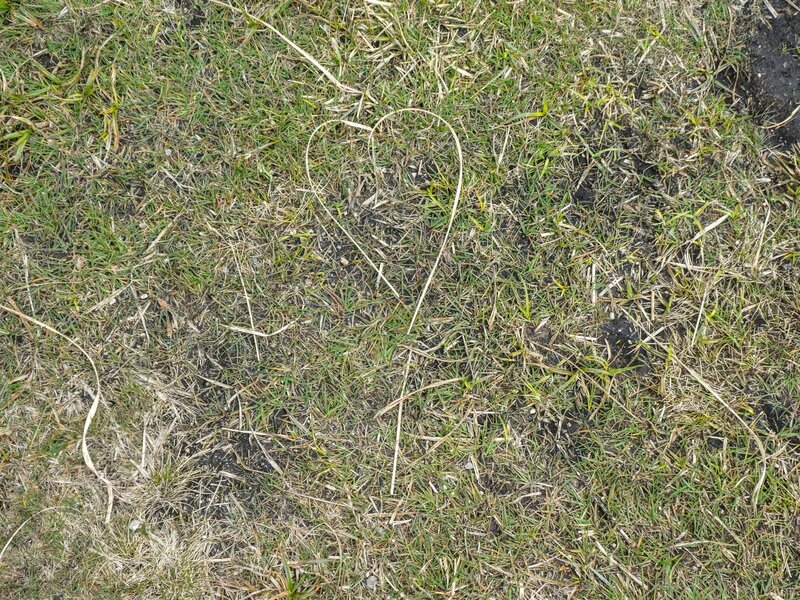 It’s easy to identify a quaker bog, it’s normally very bright green in colour (which is the Sphagnum moss) and when you stand on it the whole thing moves, pulsates, wobbles like jelly and before too long you get that ‘sinking feeling’ as you start to slowly descend into the peaty mush beneath you. It’s not advisable to spend any time hanging around a quaker bog and if you end up in that position, you’re going to get wet! Whenever I have found myself in a bog I normally just try to keep moving forward which I find, for the most part, is the best way to escape. However I really needed to just think about which way to move and eventually decided to head back across to the higher ground to the east rather than carry on further into the bog. By now I was pretty soggy after several misplaced steps resulted in me sinking into to depths of the mire and so I was just keen to get out and back on dry land. 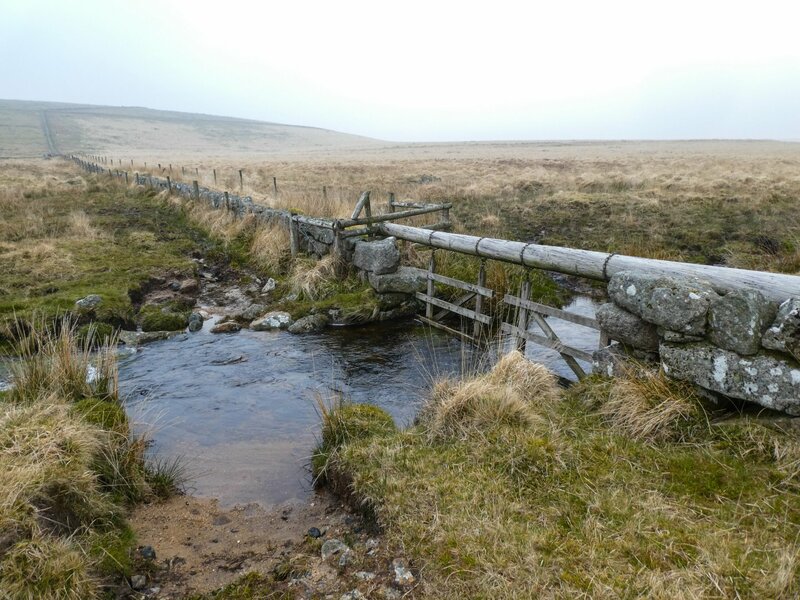 After what felt like an age my feet found solid ground and I quickly hauled myself up and away from the bog…. I wasn’t sad to leave that behind! By now the mist was starting to lift across the mire and I could clearly see Fox Tor high up to the south and below it was the unmistakable shape of Childe’s Tomb about 500m away. 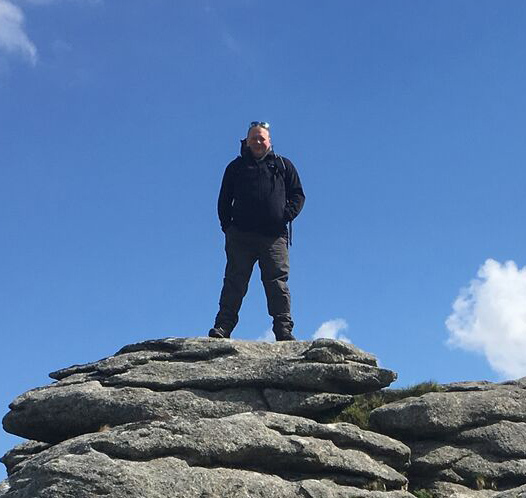 I took an indirect route to the tomb making sure I avoided ending up back in the bog and after a time I reached the large granite memorial and was able to drop my pack, get my flask out and have a little break….. I figure I had earned a cuppa and a KitKat after my brush with the mire. Childe’s Tomb is the subject of one of the more famous Dartmoor legends. There doesn’t appear to be any fixed date around this story however Childe is mentioned in Risdon’s book, ‘A Survey of Devon’ published in the 1600’s. Childe the Hunter was a wealthy hunter and landowner who had a large estate close to what is now Plymstock. He was passionate about riding and hunting on the southern moor and spent large amounts of time in pursuit of game. One winter’s day Childe was out hunting as normal and was close to Crane Hill when he was engulfed by a large violent storm. Seeking shelter he descended from the high ground and by the time he reached lower ground around the edge of Fox Tor Mire the storm had become a blizzard. 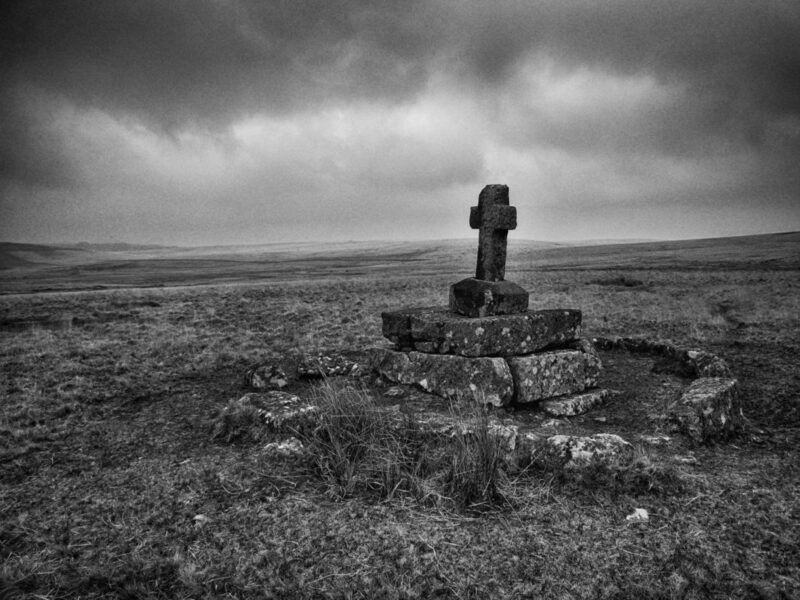 Childe soon realised he was stranded and there was no hope of him getting off the moor until the storm passed. Growing colder by the minute he pulled his horse to the ground, huddling into it for warmth but as time passed he felt himself growing even colder and soon had to make the heart-breaking decision to slaughter his beloved steed, disembowelling it and crawling inside in a futile attempt to stop himself freezing to death. 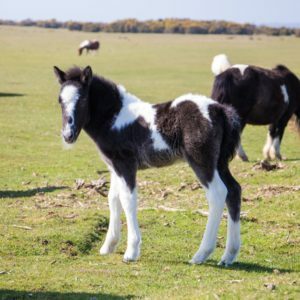 Several weeks passed before Childe was found frozen inside his horse by a passing traveller and news of his demise soon reached his estate back in Plymstock. It transpired that in his will Childe had decreed that wherever he should be buried, then the local church should become the beneficiary of his whole estate. 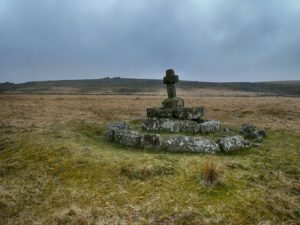 This however was not the end of the matter because the monks of Tavistock (within which parish Fox Tor Mire lay at that time) found themselves in competition with Childe’s estate to become the beneficiary of the unfortunate hunter’s will and so both parties found themselves in a race to recover the remains of Childe and lay claim to his estate. The people of Plymstock realising that they were at a disadvantage because of Tavistock Abbey’s proximity decided to try ambushing the monks as they moved Childe’s remains to the Abbey at one of the crossing places over the River Tavy, however the monks got wind of the impending trap, carried the body via a different route and were able to successfully get it back to the abbey by constructing a new bridge over the river; as a result, the Monks of Tavistock Abbey inherited the vast wealth of Childe’s estate. 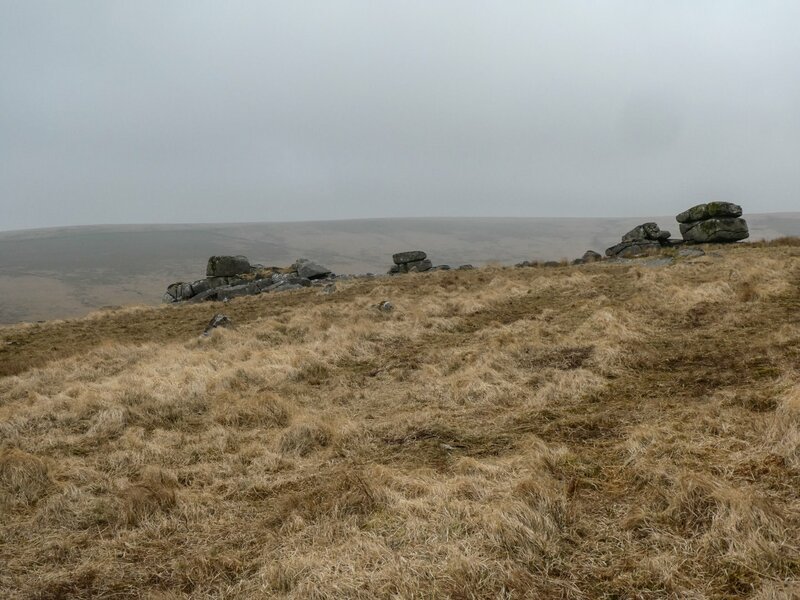 In the spot where Childe fell a ‘mighty tomb’ was erected in his honour however in the early 1800’s a nearby farmer demolished the tomb to use the stone to build his new house at nearby Fox Tor farm. Eventually the stones were reclaimed and the tomb was eventually rebuilt in 1882, although not it its original form as some of the stones that were stolen, were never recovered. 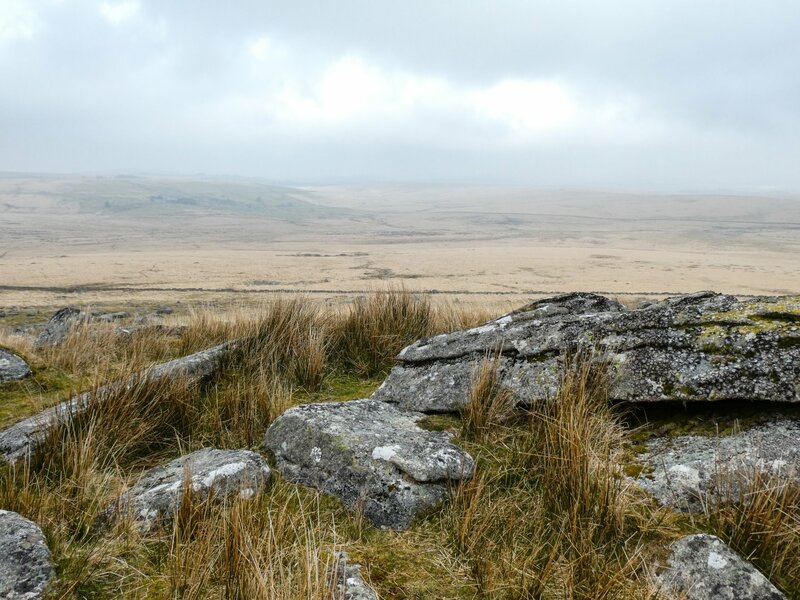 Buzz Aldrin described the moon’s surface as “Magnificent Desolation” and as I sat next to the granite tomb and looked across the vast emptiness of Fox Tor Mire I found myself thinking on these words. 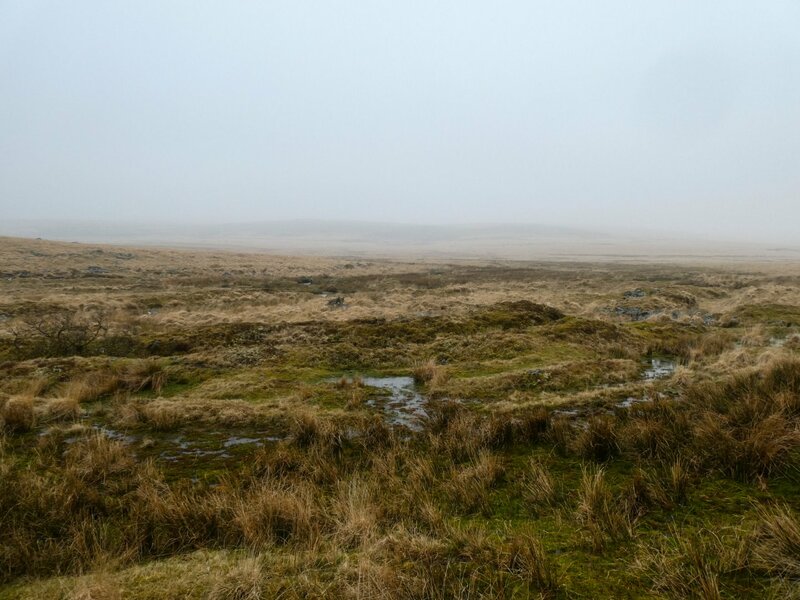 The mire is a vast empty wilderness, a bleak, solitary, lonely and desolate place but at the same time utterly beautiful and breath-taking; I could have happily sat there all day taking it all in but I was starting to feel the cold. 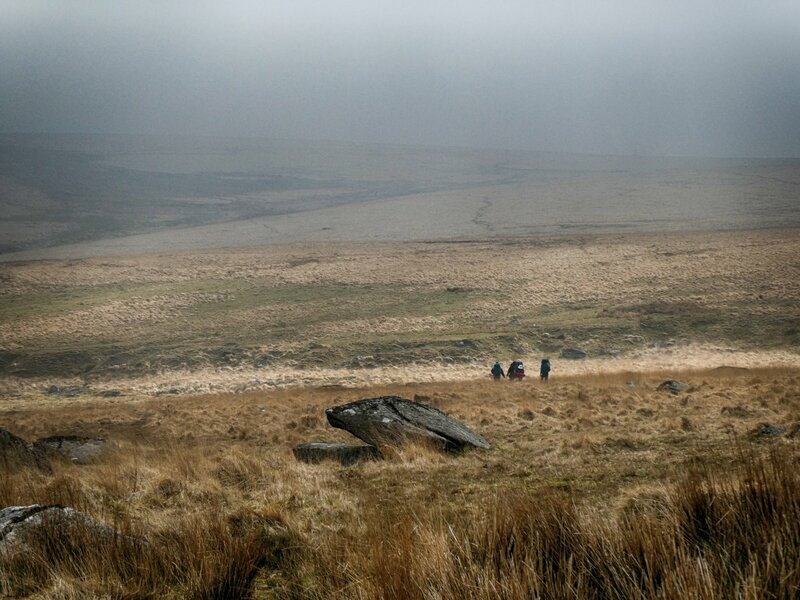 The wind that had been a gentle breeze up until now had now ramped up, so I finished my tea, got my pack back on and started off on the next leg, climbing Fox Tor itself. 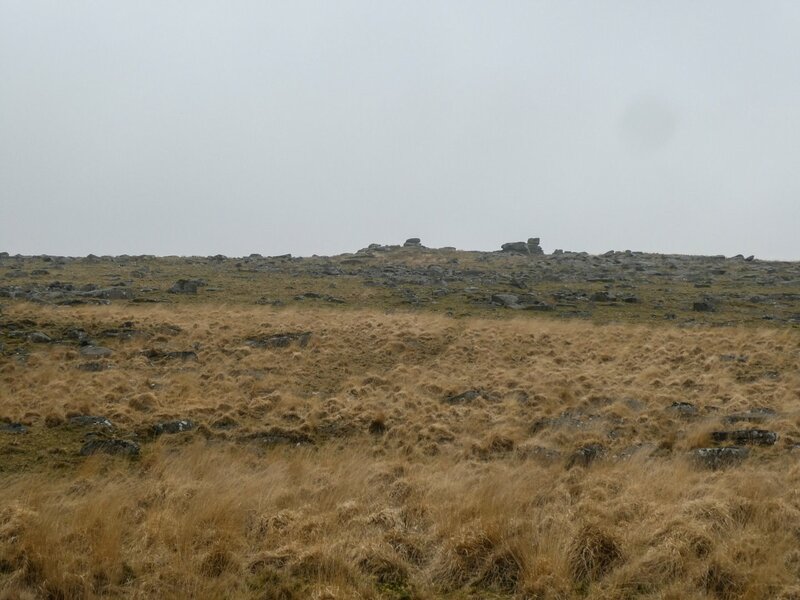 From the north, the slope to the summit of Fox Tor is steep however I had my Leki poles out and pushed myself up the slope getting ever closer to the top. 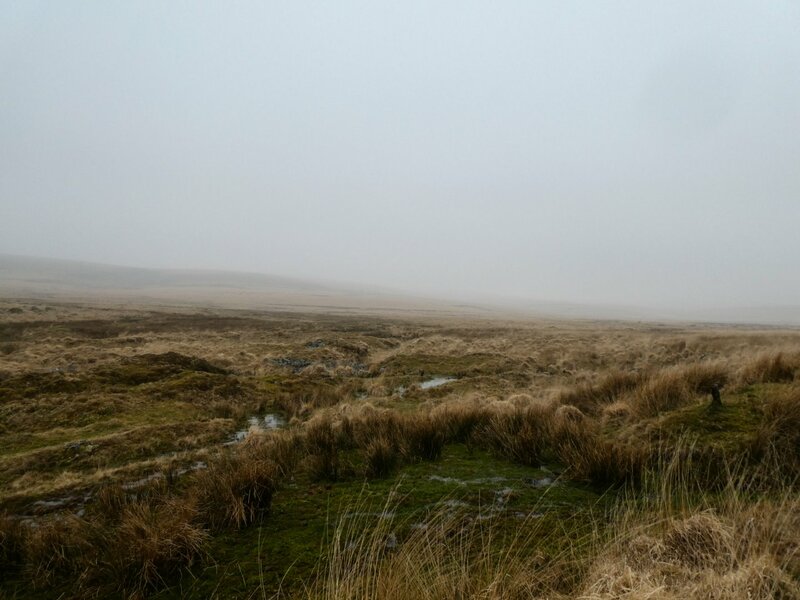 I’m not a big user of walking poles however I generally carry them on my pack for most walks as they are essential when performing river crossings or walking across the tufty grass you find on Dartmoor. 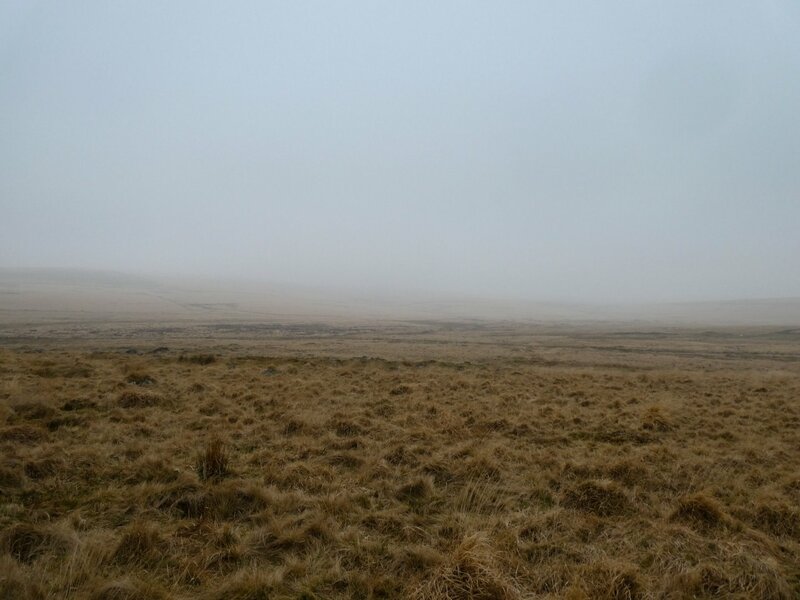 Soon enough I reached the summit of Fox Tor and was rather stunned with the spectacular view across the whole of Fox Tor Mire. Even in the mist and haze I was really able to appreciate its sheer size as it spread out below me. It was also easy to see the tracks that crossed the mire back to Whiteworks although after my earlier boggy run-in with the mire, I was keen not to try my luck any further and decided to stay up on the high ground making my way west toward Nun’s Cross Farm. 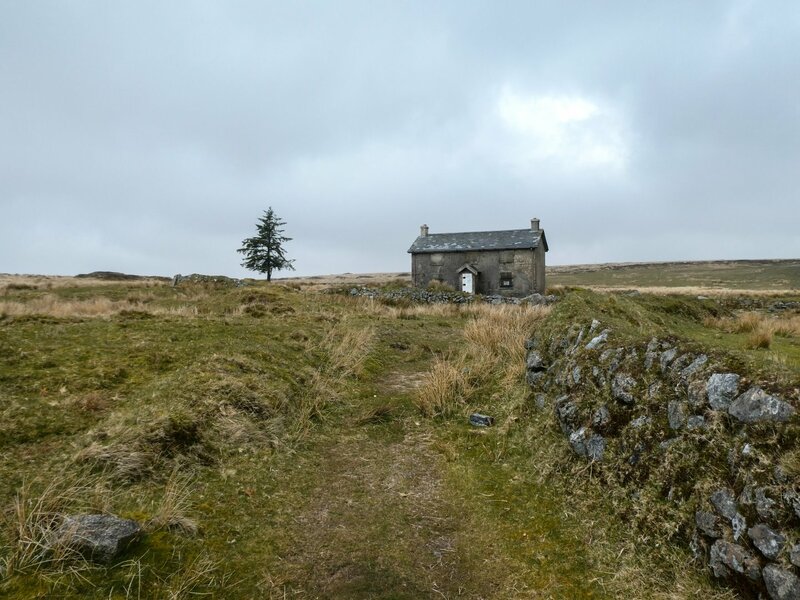 There was a fairly clear track tracing the contours of the hill which I followed for about 2.5km until I reached the old farm house at Nun’s Cross. Time was starting to tick on so I continued along the bridlepath until I was able to cut back across to intercept the Whiteworks road and then back to the car. According to the various devices that were tracking my progress, the whole walk was a shade over 8km. 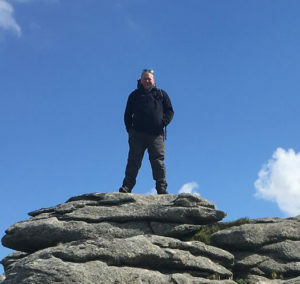 I’d more than made up for my failure to reach Childe’s Tomb and Fox Tor back in July last year and in the process found another really enjoyable route that I’ll walk again at some point in the future as the more time I spend around Fox Tor Mire, the more I feel I am drawn to it. After getting home I studied Google Maps again and found a far more suitable spot for crossing the Swincombe just 200m further downstream that would have saved me the wet socks and bog snorkelling!